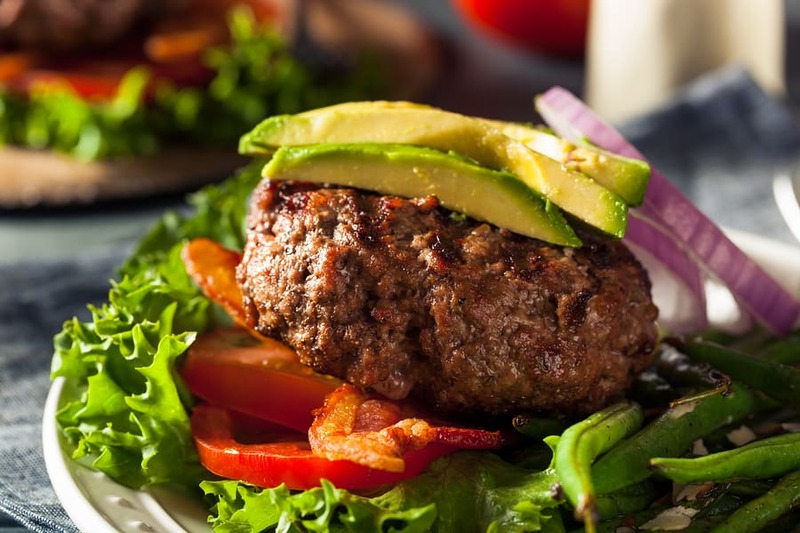 Wondering if you can dine out while eating a ketogenic diet? Keto eating out is not only possible, it’s really not all that hard. 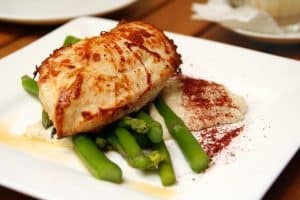 Keto is a lifestyle, and there are always ways to incorporate your keto way of eating when a busy life or social event takes you out to a restaurant. Just like Keto in general, eating out on Keto doesn’t have to be complicated, either. You can go to any restaurant and easily stay in ketosis. For your convenience, I’ve broken this article down into three sections. ProTip – The picture above is from one of our recent date nights. 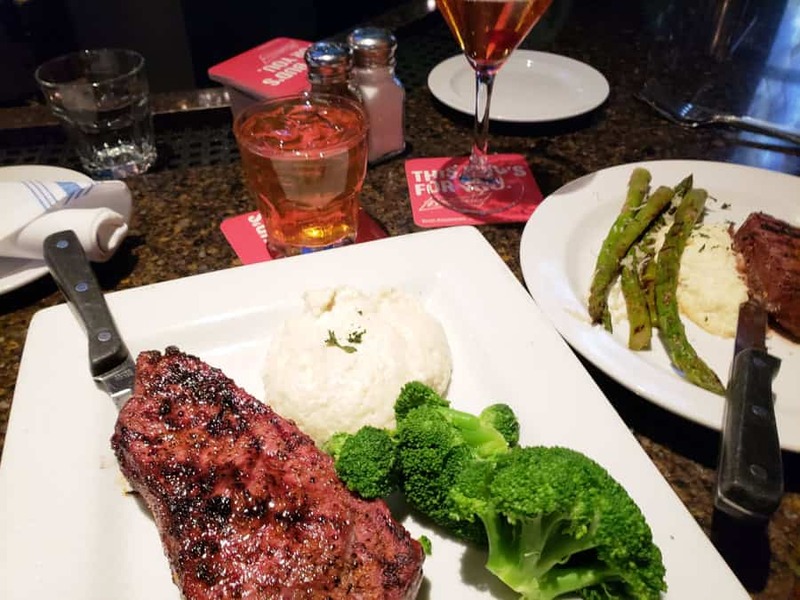 Steak, Asparagus, Super Buttery Mashed Cauliflower, and Steamed Broccoli with extra butter on the side. We even ask for extra butter x2. More and more restaurants are offering Keto Friendly options! When you are eating out, just keep your meal simple and follow the Basic Ketogenic Meal Template. If you follow me much at all, you are familiar with the Keto Meal Template. This is the basis for meal planning, and it applies to choosing meals at a restaurant just like it does at home. At least a couple of spoonfuls of fat. This can be as simple as a steak and steamed broccoli with butter. Or it can be salad greens with grilled chicken, avocado and olives. A bacon cheeseburger without the bun, lettuce wrap and tomato, and mayonnaise. Chicken marsala with grilled zucchini, butter and parmesan cheese. Pork chop with cream sauce and okra. Fajitas with guacamole and sour cream. Alfredo with shrimp and asparagus. Coconut curry with lamb and kabob vegetables. I could go on, but the point is the formula holds up no matter what cuisine. You may need to ask for substitutions, and that’s ok. If you don’t see anything on the restaurant’s menu that works for you, ask for what you want. I’ve worked in many restaurants in my day, and I can tell you that every place can cook you a simple protein without adding anything to it, steam some vegetables and give you butter on the side. When you order, if the original plating of the meal includes starch (bread, bun, tortilla, potatoes, rice, beans, pasta, etc. ), make sure they know you don’t want the items packed with carbs. Ask for a vegetable or fat substitution as you order. It’s a lot easier to order low-carb than to not eat the carbs once they are on your plate. But if for some reason you can’t get the meal like you really want it, you can eat around the carbs. I’ve eaten the filling out of burritos, passed on the crackers and chips, taken the bun off my burger, and eaten around the rice. My health, my body, my decision. You can do it, too! Stuck for ideas on what kinds of keto friendly fats you might request when eating out on keto? Butter is almost always available. Make sure it’s real butter! Olive oil is often available, too. Be careful, though. Some restaurants put canola oil in their oil and vinegar dressing. Canola oil is technically keto, but I try to stay away from industrially processed oils. Other options will be more cuisine dependent. Bacon, avocado, guacamole, sour cream, cheese, and olives. Some restaurants will have heavy cream available to put in your coffee if you ask! In its simplest form, if you follow the Basic Ketogenic Meal Template, you’ll be in good shape. The rest is just details! 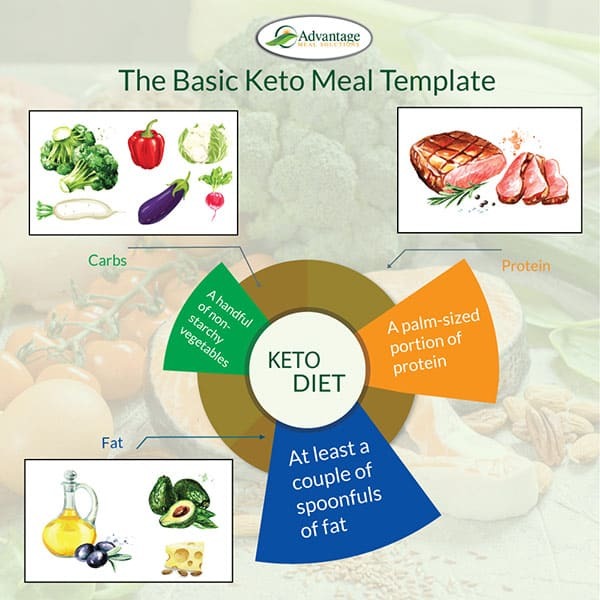 Follow the Basic Ketogenic Meal Template. Your meal should have a palm-sized portion of protein, a handful of non-starchy vegetables, and at least a couple of spoonfuls of fat. Keep it simple. Less processed and simpler preparation means it’s less likely there will be layers of carbs or sneaky carbs in the ingredients. Grilled meats, not fried. Nothing breaded. Look for steamed or sauteed vegetables. Don’t be afraid to ask for substitutions or to ask questions. Remember that “the customer is always right.” Don’t be afraid to ask for what you want. You’re the one paying for it. Be careful with sauces and gravies. Sauces are often full of sugar and gravies are usually thickened with flour. If you don’t know what’s in it, ask how it’s made or just ask them to leave it off the plate. Substitute something else that is Keto and you know that you like. Watch out for condiments and other sneaky carbs. Ketchup and BBQ sauce are full of sugar. Most Asian sauces like teriyaki, hoisin, and duck sauce are full of sugar. Low-fat and low-calorie salad dressings are usually full of sugar. Miracle Whip has sugar, whereas conventional mayo has a negligible amount. Honey mustard has sugar. Yellow and Dijon mustard are good. Horseradish, soy sauce, Worcestershire sauce, and most hot pepper sauce are all good. Also, boneless wings (or any meat that has been reformed – remember to look for less processed foods) are full of starch. French fry alternatives like sweet potato fries and onion rings are still full of carbs. Avoid Inflammatory Oils. If avoiding inflammatory seed oils is a priority for you, you’ll need to be especially diligent. Almost everything in most restaurants has peanut oil, soybean oil or some other cheap, industrially processed oil. Salad dressings, mayonnaise, oil for sauteing, sauces, even the oil and vinegar tray. Stick to whole food sources of fat like avocado, sour cream, cheese, olives, etc. Get yourself a small travel bottle and bring your own olive oil. Tell the server not to bring the bread or tortilla chips. If you’re with someone who is also Keto or who is uber-supportive of your way of eating, don’t even let the server put it on your table. If you’re the only Keto eater at the table, exercise your determination to improve your health. And maybe try to keep the basket on the other side of the table. Bring your own. I mentioned olive oil above. Other items that I’ve brought with me to a restaurant include whole avocados, guacamole cups, cheese crisps and fat bombs. I’m not saying to bring your whole meal, but if you have a small something in your purse that will give you the fat you need and you don’t think the restaurant will have it, go ahead. If anyone asks, tell them that you have to eat gluten-free or that regular salad dressing gives you “digestive issues.” No one will ask for further information. Be careful with alcohol. Distilled spirits (vodka, gin, whiskey, rum, and tequila) have zero carbs and red wine has about 4g carbs, and these are the most Keto-friendly adult beverages. If you choose hard liquor, make sure your mixer is sugar-free. While the carbs may be low, there is a catch. Alcohol is a toxin, and your body will process it first before other nutrients in order to rid your system of the toxic elements. If your body is burning alcohol, that means it’s not burning fat. So while alcohol in moderation will not kick you out of ketosis, it will potentially stall your weight loss efforts. Just keep it in mind when you are making your choices. Also, it’s a lot harder to say no to tortilla chips and dessert after a drink or two. Choose wisely. Look at the menu in advance. Lots of restaurants now have their menus available online. Taking a look before you go and knowing what choices will work for you before you get there will save time and hassle. And you’ll probably have less explaining to do when your companions wonder why you’re scrutinizing the menu so closely. You don’t need dessert. I know, we’re all conditioned to it, especially when we are out to eat. Part of being Keto is bucking conventional wisdom, though. Just because everyone else is doing it doesn’t mean you have to, too. The dangers of sugar are becoming more well known, though, and skipping dessert isn’t the “thing” it once was for most people. You might not even get a second glance from your table mates if you skip the sweets. If you’re still hungry, though, and you’re at an establishment that has a cheese plate or fresh berries, then you’re set. Order coffee instead of dessert. Ask for heavy cream for your coffee or berries. Maybe break one of this fat bombs out of your purse. Don’t talk about Keto. I doubt you went out to eat with this person or these people in order to create an army of Keto converts, so don’t make your way of the eating the center of the conversation. Unless you are talking with someone that you already know is very supportive of your ketogenic lifestyle, keep any conversations about your way of eating short and simple. Focus on the positives, with short comments about how great you feel or the weight you’ve lost. 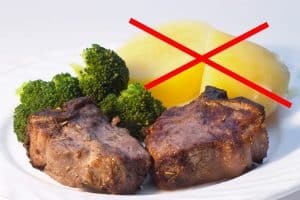 If asked about what you “can” or “can’t” eat, choose phrases like “I choose not to eat…” instead of “I can’t…” The more positive your framing, the more people will understand this is a lifestyle, not a fad diet. Then you can move on to other topics of conversation! Fast food joints are a little different. While you can still ask for changes and substitutions, there’s a bit less leeway than at a sit-down restaurant. Always go without the bun and no fries or chips, and nix the ketchup. Be prepared with these ideas for options at a few popular fast food restaurants. I know that this list is far from all inclusive. If you have a favorite Keto restaurant option that’s not on the list yet, please, tell me about it in the comments below. I’d love to add your favorites to help others. Thanks for showing me how you figure carbs! I’m into my third week and cannot get into full blown Keto! I feel amazing and have no afternoon crash. Love that! Fat is an issue so trying to overcome the fat block! Thanks again. Isn’t it amazing how hunger changes when you’ve become fat adapted on a Keto Diet? Tell me more about how you are not fully in ketosis…not seeing ketones on the test strips?